Who doesn’t love those crunchy, yummy deep-fried southwest eggrolls from Chili’s? I know they are difficult for me to resist. That’s why I’m in love with this recipe. 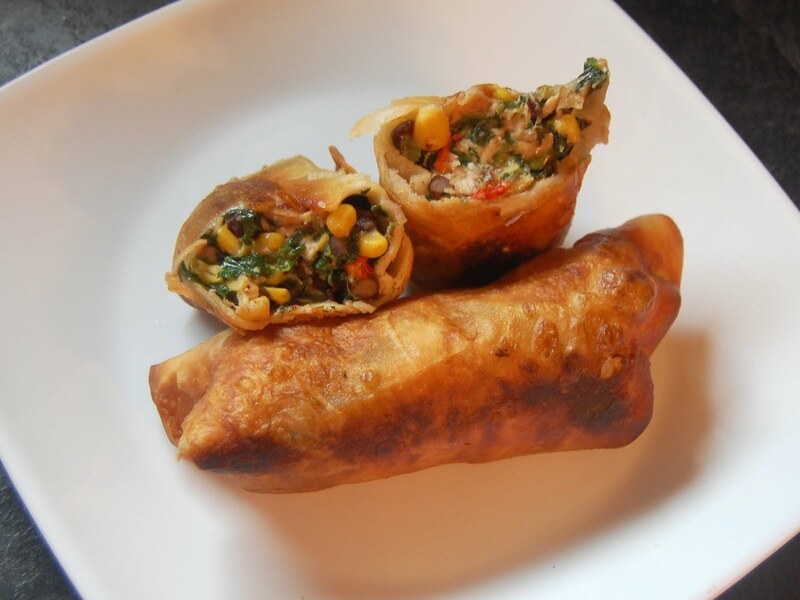 It’s a much healthier, BAKED, easy recipe for the southwest eggrolls! You get to skip the extra calories and fat, and enjoy the delicious baked goodness of fresh veggies! Heat a skillet over medium heat and spray with nonstick spray. Stir in green onion and red bell pepper and sauté for 5 minutes or until tender. Add the diced chicken, corn, black beans, jalapeno, cilantro, cumin, chili powder, and salt. Cook for 5 minutes and stir well to combine. Remove from heat and stir in cheese until melted. Take 1 sheet of phyllo dough and place on a clean dry surface. Spray well with nonstick spray. Fold into thirds, spraying each layer. Spoon 1/8 of the mixture onto the small end of the phyllo and wrap tightly, folding in the sides. Place on a sheet pan and spray with nonstick spray. Keep phyllo from drying out with a damp towel. Bake in a preheated 350 F oven for 15-20 minutes. Serve with fresh salsa. Serves 4.